“Imagination is more important than knowledge. For knowledge is limited whereas imagination embraces the entire World, stimulating progress, giving birth to evolution”..
Antonino – You are a funny man – just like the one your are being compared to!!! This is an interesting point for discussion. I see imagination as the impetus to invention but also see imagination and knowledge as a symbiotic relationship where turning imagination into reality is dependent on knowledge. For example, I’m sure humans dreamed or imagined flying like birds thousands of years ago but the reality of human flight occurred through acquired knowledge. Much of Einstein’s work was based on theory requiring the knowledge of prior proven laws to conduct the experimentation to make his theories credible. Yes imagination does stimulate progress but without knowledge can evolution occur? If our evolution as artists was only based on imagination would we be producing works in such a variety of mediums and techniques? The need to create is the driving force in evolution. Imagination is the catalyst and knowledge the DNA. Leonardo was an Italian polymath: painter, sculptor, architect, musician, scientist, mathematician, engineer, inventor, anatomist, geologist, botanist, and writer. However, Leonardo was not autodidactic in his study of the arts, as he was trained through the Guild system, just as other Renaissance artists had been. Although in one biography I have read on Leonardo, it did mention that he was an autodidactic reader from an age he could first clasp a book. The field of psychology and visual art share several areas of investigative interest. One of these is visual perception. Within this field, this investigation of opstraction has explored the concept of Gestalt. From prehistoric to modern times, civilizations have employed repletion and patterns as if to convey a secret language, mathematics or meaning within visual perception. When investigating the microscopic world, the rituals of patterning reflect the hidden mathematic complexities of diamonds, DNA, cellular structures, and fractal geometry to name just a few of the many examples of patterns nature has to offer towards the concept of Gestalt. Patterning and repetition has also had a symbolic relationship with color and color theories. Tapestries, fabrics and even the natural world flora all exhibit a distinct patterned rhythm associated with visual display and colorful representation. Art is a visual language and an ideal vehicle for encompassing these reference points, while exhibiting similar concepts in pattern, color, repletion, abstraction and mathematics. Hello to both Peter and Terrence thank you for your opening comments to our topic.., we should use our weekend to set the level of activities that should continue through the week. Therefore I am delighted to add another great thinker Albert Einstein to our creative lounge. Very interesting point here imagination vs knowledge, this is one of Albert Einstein famous quote that we want to cover a topic of discussion in the interest of Art. We are looking for different points of views and opinions? Did his theory influence you in your Art? We have all experienced the physical effect of the relationship of movement between two objects in particular with regard to our perception and physiological effect resulting from an experience of sitting at a traffic light, stationary while traffic in an adjacent lane moves forward giving us the perception, that even though we are stationary we sense ourselves moving in the opposite direction.. I cite this as an example that sparked Einstein’s thoughts on relativity. It is Einstein’s ability to contrive and conceive a theory based on such an experience, an experience commonly experienced, that intrigues me as an artist. I have not achieved such an insight and perhaps never will but it will always be part of my quest in evolving my work. Exact Edgar, man will never put under lock and key thoughts of another being. Flying, thoughts have wings, go beyond the countries, Nations, continents, are free to go where they want. Be a creative project Inspire yourself and others to step lightly on this beautiful planet of ours and strive to be always the custodian and never the conqueror. Wake-up to the full glory and beauty housed in every moment, “IT” is happening in our body, mind and spirit. No right or wrong, good, better, best, because breathing knows no judgment. Enjoy the ride. Hello Sunil, I whole heartedly agree with what you say. It all begins with imagination and would like to add that quite possibly a little optimism feeds the process. I would also add that having imagined the concept, knowledge would play an important role in the creation of the piece. If my role was in academia I could live and teach through my imaginings and achieve notable concepts but being an artist practitioner my imaginings need to take form reflecting technical skill in execution. Yes, Antonio, you present the creative process familiar to artists and illustrate the importance of freshness and simplicity and nothing is more evident when the freshness and simplicity is lost in a work. This freshness and simplicity is most evident in the art of children as they are most imaginative. To maintain a child like imaginative thought process as we learn to perfect our skill in material application would be ideal in our evolution as artists. To discard knowledge and put all emphasis on imagination would be to throw the baby out with the bath water. Imagine what our history would look like if learning was no a prerequisite to creating. Would we see the same great works of the masters or would art have evolved on a purely intellectual, conceptual path leaving us with a collection of imaginative experiences shared in the moment with no concrete material creations because learning / knowledge was ignored in the creative process. Edgar, That’s not so bad. It would put me in the British Museum as a 17th century Dutch artist. Humor aside, This is why we need to communicate beyond translations. Hauptmann: Sobald jemand in einer Sache Meister geworden ist, sollte er in einer neuen Sache Schüler werden. Hesse: Am Ende einer Sackgasse finden sich die meisten Kneipen. Ebner-E.: Wirklich gute Freunde sind Menschen, die uns ganz genau kennen, und trotzdem zu uns halten. Teresa: Das Leben ist eine Chance – nutze sie. Google: Hier können Sie Ihr Zitat hochladen >> Berlusconi: Ich bin in der Politik, damit das Gute das Böse besiegt. Tea-Party: Besser als die Tea-Party-Bande ist wichtiger als die Schläge, die tut. Arlen Specter Orakel: Ich werde dir nicht antworten. Verlass den Tempel. Unsere Fantasie wird daraus die tollsten Bilder produzieren! Übrigens: Darf sich jeder von uns seinen persönlichen Privat-Denker zulegen wie einen Privat-Heiligen? Hauptmann: Once someone has become a thing Master, he should be students in a new item. Hesse: At the end of a cul de sac you will find most pubs. Ebner- E: . Truly great friends are people who know us very well , and still keep us . Teresa : Life is an opportunity – use it . Google: Here you can upload your file >> Berlusconi: I’m in politics, so that good conquers evil. Tea-Party: Beating the tea party gang is more important than who does the beating. Arlen Specter (Google-translater) Oracle: I will not answer you. Leave the temple. Our imagination is it produce the most amazing pictures! By the way: If may each of us his personal private thinker define as the private Saints? Come on and do more than just talk! I’m enjoying this entire conversation and everything that’s been written has merit. Yes, knowledge is important to the creative urge in order to make a sculpture move, to weld, etc. Knowledge about the quality of materials is important. Knowledge about the world past & present is necessary to dream of an imaginary world. Looking, understanding what’s going on in the current world could spark a creative moment. I think that knowledge & imagination are always coming together to dance for a while then drifting off to gather their inspiration. Edgar, you forgot to mention a great thinker the brother of Albert, which says: If you believe inte, anything is possible. 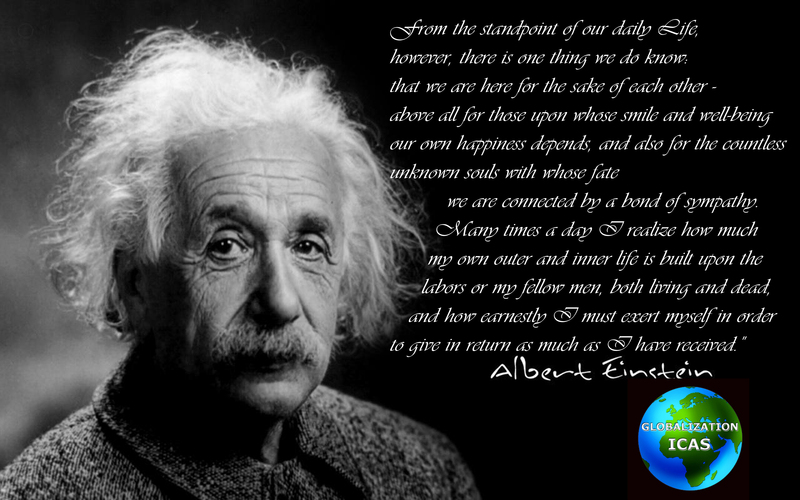 Thank you Terrence for reciting words of Albert Einstein in our creative lounge, I am proud to say here at Globalization ICAS we have the living proof of his virtues.., What are your thoughts?